A contemporary photographic wallpaper featuring portraits and architecture set on a textured background. Fantastic for feature walls, hallways, stairs and landings. 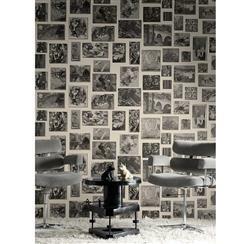 This is a construction print wallpaper printed over 3 rolls to give maximum repeat variation. Please note that this design is sold as a 3 roll pack.